Save thousands on the stunning ‘Griffith’ at Taylor Wimpey’s Abode! A new housing development in Highnam, which will bring investment of more than £250,000 into the local community, is proving popular amongst buyers. The Bellway development, known as Lassington Reach, is being built off Lassington Lane and new homes there are being snapped up by home-hunters with 20 sold already. As part of the planning agreement for the development, the housebuilder will be investing around £40,000 towards Highnam Surgery, £50,000 towards play equipment at Highnam Recreational Park and over £180,000 towards local sports facilities. A further £4,500 will be put towards recycling and over £1,000 will be spent on dog waste bins in the community. The development will be made up of 88 two, three, four and five-bedroom properties, with 40 per cent of these being affordable homes. Billie Oaten, Sales Director for Bellway’s Wales division, which is building new homes across South Wales and Gloucestershire, said: “We are extremely pleased that so many buyers have shown an interest in Lassington Reach. With substantial investments in the local area, this development promises not only to provide much-needed housing, but also to be an important addition to the community for years to come. “Lassington Reach really does offer something for everyone, and with schemes such as Help to Buy and Part Exchange available, these new homes are suitable for all types of buyers. 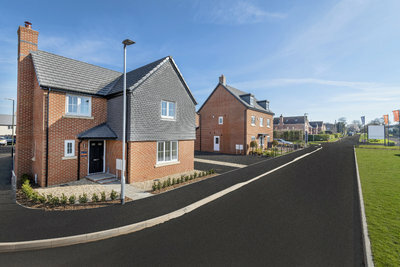 Bellway is currently selling three and four-bedroom houses at the development. More information on the homes available at Lassington Reach can be found at bellway.co.uk.